Bon Scrapatit Designs: monday in the marketplace ... amazing and inspirational finds in scrapland and beyond ... and a killer photo book deal! monday in the marketplace ... amazing and inspirational finds in scrapland and beyond ... and a killer photo book deal! I'm late due to more labor than I had anticipated on the home front today! ARGH! Well, even if you are not in the USA, I still wish you a Happy Labor Day as I don't think there is a single one of you out there that is not "laboring" in one way or another! And speaking of laboring, we have another grandchild on the way ... like any day now! His name is Mylles and his mother thought it would be pretty cool if she found herself actually in "labor" during the Labor Day weekend! Not going to happen as it is now just after midnight, Tuesday morning! I'm not sure about the rest of you, but Mondays are, generally, slow-going for me. I am not quite sure as to why that is, it just is! So, I thought since I typically spend the greater part of my Monday cruising around Scrapland ... and beyond, looking to see what might catch my eye in the way of inspiration or a GOOD deal, that I would share it with y'all too! You might be wondering if I'm being compensated in any way for anything or anybody that I promote here at Bon Scrapatit Designs during my excursions out-and-about Scrapland and the answer is "no"! This is something that I've long wished to do, but with my health issues the past year and then my travels, I just never could seem to get it going! All things for a purpose and the right time has presented itself for me to share with y'all some of the people, places and things that catch my eye! The items I shall be sharing with you today have all actually just about fallen right into my lap! Or, should I say, I just happened to be in the right places at the right time! LOL! I was on Facebook trying to catch up a bit and saw the image below, which had just been posted by Bunny Cates, owner of Digi Scrap Obsession (DSO), whom I had just featured here on Friday! Bunny had asked Gaye Lambert of GS Creations to draw her a Goth girl and this is what she came up with! Isn't she just THE cutest thang? LOL! 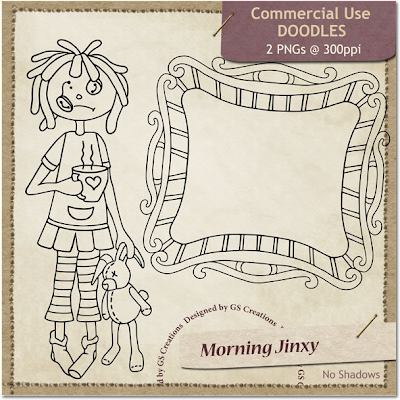 I have long admired Gaye's artistic abilities and this sweet illustration, Morning Jinxy, just reaffirmed that admiration earlier this morning! My next find was also one that I stumbled upon after having made a purchase and going back to check something out over at Memory Scraps! A designer there, Lauraskathi (Kathrin Pfetzing), who creates some really GORGEOUS designs, is retiring from designing and has put several of her scrapkits on sale for ONLY $2.00! *40 Years* includes 21 papers, 112 elements and 2 alphas in 10 different languages, each of which can be downloaded separately! WOW! 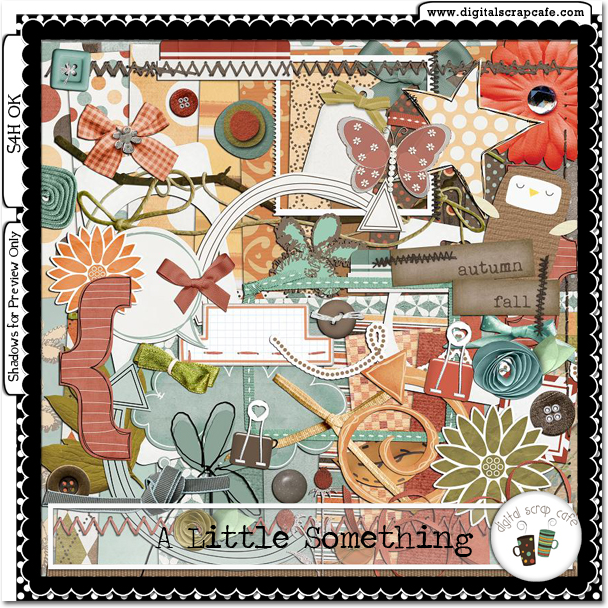 This gorgeous scrapkit is filled with happy colors and chock-full of scrapping goodness! *Summer Vacation* boasts of 31 papers, 122 elements and 1 full alpha! This scrapkit is also on sale for ONLY $2.00 and is sure to scrap many a trip to the beach, an island get-away, or a tropical vacation. This kit is very versatile and will make for lots of wonderful everyday moments to be beautifully preserved as well! The lovely patterned papers and meticulously extracted embellishments will make your layouts shine! I cannot wait to snag these two! 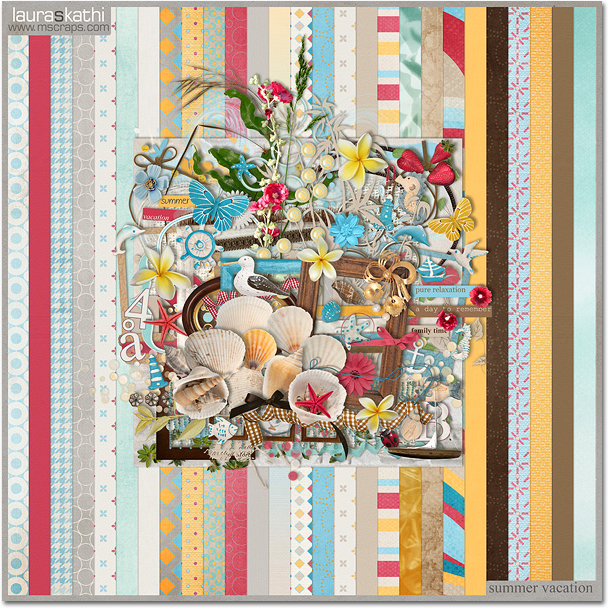 You will find Kathrin's store at Memory Scraps HERE and while you are there, check out the other kits she has on sale for $2.00! More shopping on my list tomorrow! Over at Digital Scrap Cafe this month, their talented designers have put together A Little Something for us! It is an AMAZING September collaboration for the super low price of $5.99! I love the muted Fall colors that will scrap a multitude of events. You will find 70 papers, 122 elements and 4 templates in this plethora of scrapping delights! I'm sure you'll agree with me on the nice blending of traditional scrapbooking elements and darling doodles and I simply cannot fail to mention the sweet stitches and pretty paper flowers! 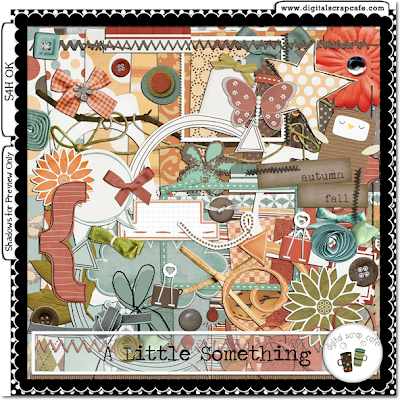 If you'd like A Little Something for your scrapping stash, click HERE! The last of my finds out in the marketplace today were outside of Scrapland, yet very closely connected! LOL! There is an awesome and pretty popular CoffeeShop I've been to a few times over the past several months and I just found my way back over there today since my time away! The CoffeeShop that I am referring to is owned by a very talented and generous young lady, wife and mother of two, Rita! I shall let you stroll on over there at your leisure and scour the premises for all that your eyes can take in during one visit. I guarantee you'll be back over-and-over again to digest all that Rita has to offer in the way of photography tools via actions, tutorials and more and the best part is that they are all free! Rita's newest action is PowderRoom After Dark and you can find it HERE ... for free! Oh, and you may as well grab yourself a cup of coffee because you will want to sit at the CoffeeShop for a spell! LOL! If y'all stop on over and download, please make sure to leave Rita some love and let her know that I recommended her! Thank you! I know that she will really appreciate it since she and her entire family are still recovering from mono and she is still bestowing her readers with amazing gifts! And, isn't Rita's puppy just the cutest? OMGosh! I love those big blue eyes against her chocolate coat! Last, and certainly not the least, is a quick blurb for a killer deal from Shutterfly and Groupon! 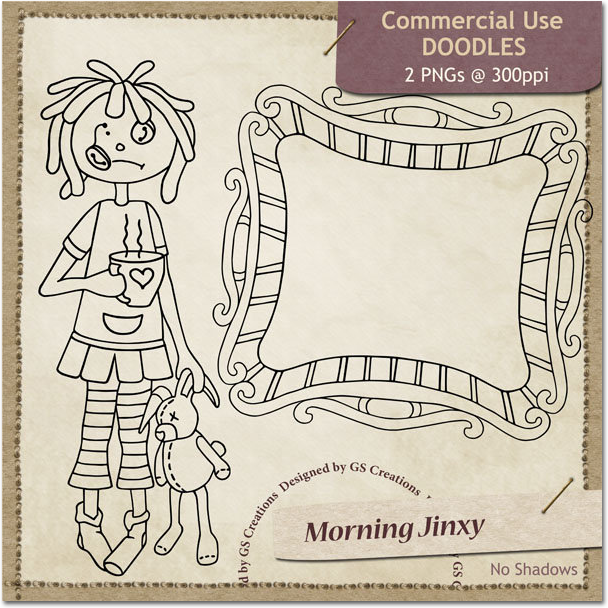 I found this via a tweet with the hastag #digiscrap attached and, of course, just had to check it out! Am I glad I followed my curiosity as I am now the proud owner of a coupon that I only paid $10.00 for, which will allow me to purchase an 8x8, hardcover photo book from Shutterfly (plus shipping and handling)! WOOT, WOOT! I've been wishing to create a photo book for some time now, but whenever I get an email for a special from Shutterfly, I never follow through because they simply do not give me ample time to be able to design one the way I wish to! Yes, I know I can create and then wait to print when a good sale comes along, however, seeing as how I've not completed one yet to see whether or not I will be happy with preserving my memories this way on a regular basis, this deal via Groupon is perfect and will give me until November 22, 2010 to get 'er done! ROFL! Here is where I registered to become a member of Groupon (I even uploaded an avatar and contributed to the forum! Can you tell I was excited? LOL!) 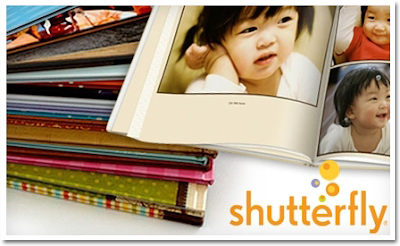 and then purchased the coupon for Today's Deal: $10 for a 20-page 8"x8" Hardcover Photo Book from Shutterfly! I wish you all an AMAZING day and I will be back, hopefully later today, with a little goody for you as well as a really genius cake recipe that has everyone going gaga over here! I'll give you a hint. There are only two ingredients used and it is moist and delicious! I am not a cake connoisseur, but this just might change my mind!